Opendoor Studio: Look ma no patterns ... look what Krista made ! My new Etsy friend Krista is so crafty and creative. Several months back she purchased a wonderful vintage box chock full of bias tape... all kinds and colors and so much fun. I loved the box just to look at but she had something else in mind... She sent me a link to her blog called " look ma no patterns" which is DARLING! 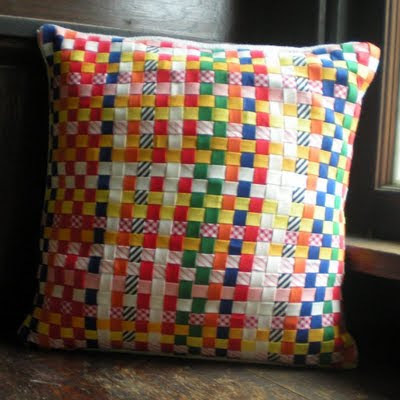 She is crafty and creative and made a pillow cover out of the fabric bias tape. She has blogged a " how to"! I hope you will check it out. There, you will find lots of other wonderful photos and instructions telling you exactly how she makes her things . She is a woman after my own heart! Kinda a kindred spirit. Krista, on the other hand... DOES!!!! Check out her blog for yourself. She has an etsy shop as well. ( kitschcuisine.etsy.com ) Check it out too while you are at it! thanks for stopping by and ...remember.... be enlightened...Get Creative!